When I had a dozen Belgian beers arrive on my doorstep a few weeks ago, it was clear that Fate wanted my Beers of Christmas to have a Belgian theme this year. I’ll start with a beer from Brewery Timmermans, who have been brewing in Itterbeek, just outside Brussels, for more than 300 years. 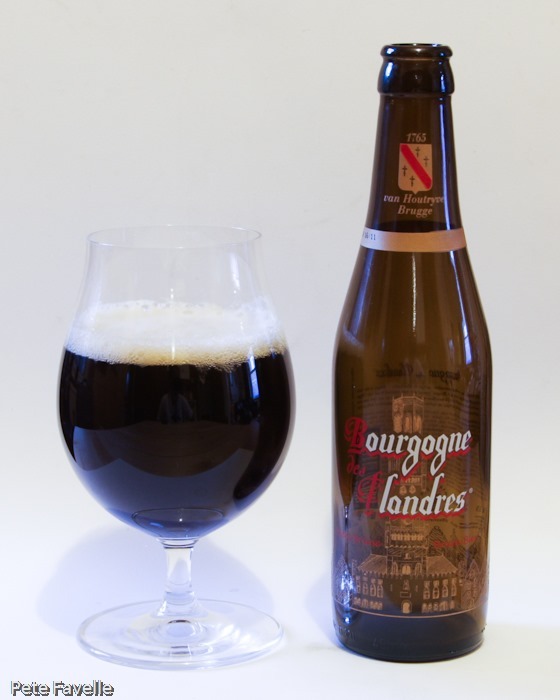 This is Bourgogne des Flandres Brune, a “lambic infusion” beer at the relatively low strength of 5% ABV. It’s a blend of “a selection of the best lambics” along with a regular brown ale, which is then barrel-aged for a few months – all of which leads me to expect something a bit unusual. It’s a gloriously dark, reddish brown beer with a long lasting, fine bubbled head on it. The nose is relatively light, with the light acidity of crisp green apples and the sweetness of bananas cooked with a little Demerara sugar. There’s plenty of acidity in the mouth, almost cider like but well balanced with a sugary sweetness. The longer it spends in the glass, the sourness is lessened and hints of toffee start coming through too. The finish is sharp, and leaves your teeth feeling like you’ve been eating rhubarb but unlike some less sophisticated sour beers I’ve tasted recently (and ended up pouring down the sink), this one is intriguing and perfectly balanced – 3 stars.